For the 24 hours to 23:00 GMT, the AUD declined 0.17% against the USD and closed at 0.7086. LME Copper prices rose 0.3% or $18.0/MT to $6120.0/MT. Aluminium prices rose/declined 0.03% or $0.5/MT to $1840.0/MT. 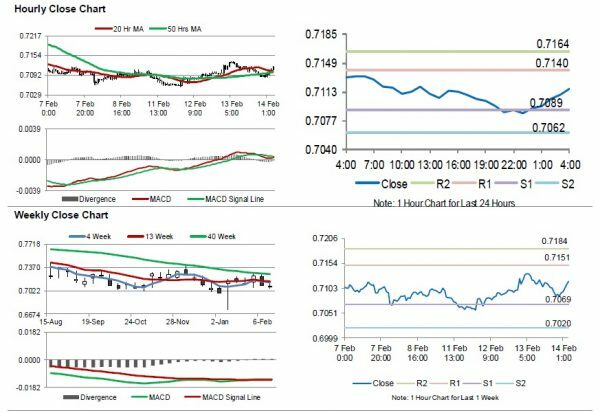 In the Asian session, at GMT0400, the pair is trading at 0.7117, with the AUD trading 0.44% higher against the USD from yesterday’s close. Overnight data indicated that Australia’s consumer inflation expectations advanced to 3.7% in February, compared to 3.5% in the prior month. Elsewhere in China, Australia’s largest trading partner, trade surplus narrowed to a level of $39.2 billion in January, compared to a level of $57.1 billion in the prior month. Market participants had expected the nation to post a surplus of $32.0 billion. 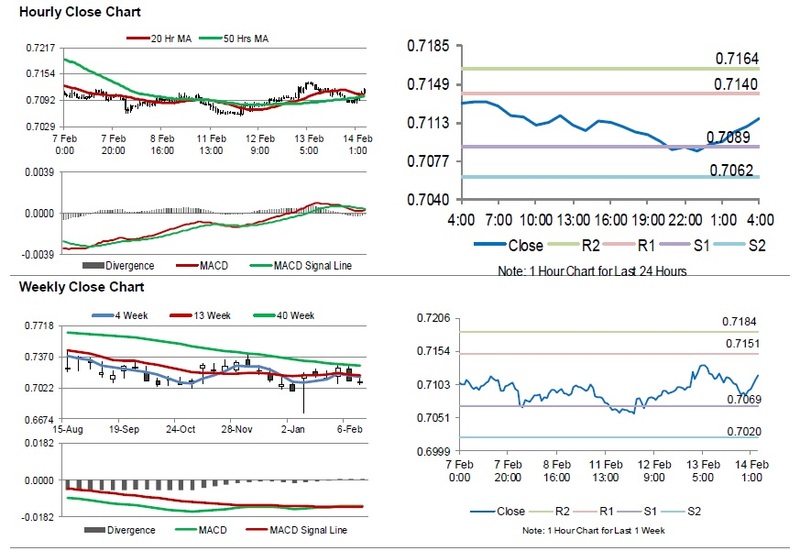 The pair is expected to find support at 0.7089, and a fall through could take it to the next support level of 0.7062. The pair is expected to find its first resistance at 0.7140, and a rise through could take it to the next resistance level of 0.7164. The currency pair is showing convergence with its 20 Hr moving average and 50 Hr moving averages.